Four types of communities are available to residents: general communities, living-learning communities, living groups, and residential colleges. General communities are open to all students. Members of our general communities enjoy a residential experience that offers enrichment connecting to common general interests. Living among peers of varied educational interests and participating in programming led by student housing staff enhances student success and helps community members to build skills that bring success in their careers and in life. Our optional communities, which include living-learning communities, living groups and residential colleges, offer unique residential experiences to members. Community events and activities align with members’ interests and needs. 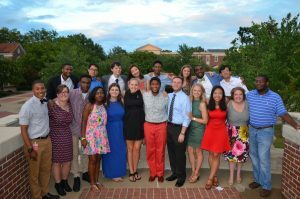 Through partnerships with faculty, LLCs give students opportunities to enhance their residential experiences by connecting with their peers through events and activities designed for participants in specific academic programs. Members of our living groups enjoy residential experiences that offer enrichment outside of the classroom that is tailored to their interests. Living among peers who share common interests and participating in events and activities led by campus staff help community members to develop skills that bring success during and after their undergraduate years. The residential colleges (RCs) offer enriching experiences to undergraduate students of all classifications. These family-style communities include faculty fellows who live in the buildings and host events and activities for members.